From 27 to 30 January 2018. In the past year we have seen the authorization for glyphosate use in Europe extended for another five years, the provisional approval of the CETA trade agreement awaiting the response of national parliaments, Corporate Mergers between large agribusiness and pharmaceutical industry. Are big corporations taking control of our lives by gradually reducing any space for democratic participation? And what is the role of civil society, which is more and more concerned about the increasing harm to the environment and citizens’ health, at a time when decisions taken at global level would have serious impact on the local level, on our everyday life and quality of life? These themes will be discussed with Indian scientist and activist Vandana Shiva, president of Navdanya at the meeting organized by perUnaltracittà, in collaboration with Navdanya International, which will take place at Spazio Inkiostro,Via degli Alfani 49r, Florence, on Tuesday, January 30th, at 5.30pm. The event “Corporate profit is poisoning our Food, our Soils and the Planet. What are the alternatives?” will see the participation of journalist Monica Di Sisto and Dr Patrizia Gentilini (ISDE Association of Doctors for the Environment), who will discuss with Vandana Shiva the foremost crises and real alternatives in a historical moment in which politics increasingly appear to be at the mercy of multinationals’ powerful lobbies. Journalists interested in interviews are invited to reach Spazio Inkiostro at 4pm (press credentials requested. Please contact info@navdanyainternational.it, tel. +39 328 6334318). In view of the upcoming parliamentary election in Italy, the meeting is taking place at a particularly sensitive time. 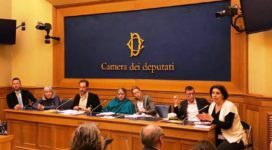 In this context Monica Di Sisto will present the results of the Campaign “Stop CETA/TTIP”, supported – among others – by Navdanya International, which played a key role in the block of the free trade agreement approval in Italy. It is therefore essential, in view of the next legislature, to get firm commitments from candidates with regard to commercial treaties, which have little to do with trade, but rather with the dismantling of national regulations that protect local production, which would have catastrophic effects on small quality production, employment and citizens’ health. 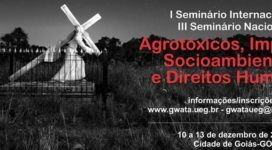 The new government will also be called upon to take a stand on the issue of glyphosate, the powerful herbicide, which use has been re-approved in Europe despite the Monsanto Papers scandal, the controversy on conflicts of interest involving regulatory agencies and the alarms launched by independent scientists, added to those who testified at the recent Monsanto Tribunal, organized by civil society organizations around the world, including Navdanya. Vandana Shiva will expose the strategies of agribusiness corporations, known as the Poison Cartel precisely for their ability to establish an oligopoly to obtain maximum profits at the expense of citizens. She will also outline Navdanya International campaign for poison-free, biodiversity based ecological agriculture. Among the various corporate threats, focus will put on the merger between Monsanto and Bayer, which, together, would control around 31% of the world’s commercial seed market and 26% of the agro-chemical market. Vandana Shiva will update the audience on the latest developments and illustrate Navdanya’s campaign opposing the merger, currently being examined by national antitrust bodies and, generally, on the corporate plan to control ownership of seeds and expand a model of industrial agriculture that is poisoning the soil and the food we eat on a daily basis, as outlined in the recent report “The Toxic Story of RoundUp“, the main glyphosate based herbicide marketed by Monsanto. 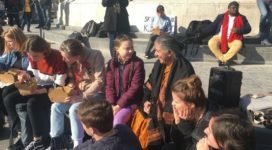 Dr Vandana Shiva will be speaking on the theme of “Responsibility and Environment”, at Teatro Niccolini, Via Ricasoli 3, Florence, on Saturday, January 27th at 10:30 am, promoted by Fondazione Cassa di Risparmio di Firenze with the patronage of the Tuscany Region, the City of Florence, the University of Florence and realized in collaboration with Teatro Niccolini and Fondazione File. On Sunday, January 28th, at 6pm, at Cinema Odeon, Piazza Strozzi, 2,Florence, Dr Vandana Shiva will give a “Lectio magistralis” entitled “Earth Democracy “. 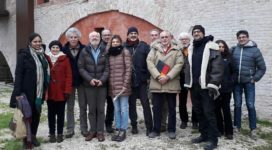 The event is organised by Cinema Odeon Florence and Navdanya International , in collaboration with Edizioni Le Piaggie, Terra Nuova and LEF Libreria Editrice Fiorentina. Dr Vandana Shiva’s Lectio Magistralis: “Earth Democracy”.